Ross Turnull: The inspiration struck me when the profoundly magical richness that's possible in cinema was brought home to me, probably following a screening of Jacques Tourneur's Canyon Passage (a film I can't remember now but that at the time, we carefully parsed). I attribute my realization to a teacher at university named Robin Wood. He was a respected film critic and theoretician who wrote numerous books, including one called "The American Nightmare", which is about horror films. As a prof in a first year film studies survey course, he was passionate, irascible, articulate, impatient and extraordinarily learned. Those are perhaps mixed virtues in a prof but his passion and conviction were what persuaded me, and made me want to pursue filmmaking myself, although, to my knowledge, Robin Wood was never a practitioner himself. AL: What made you decide you wanted to make this film? RT: I and my partner, Jennifer Hazel, finished a very low budget, feature drama in 2010 called Sight Unseen. That was an arduous project, so I wanted to direct something using a filmmaking approach we'd pursued in a couple of earlier short works, which was to make a so-called diary or 'process film'. 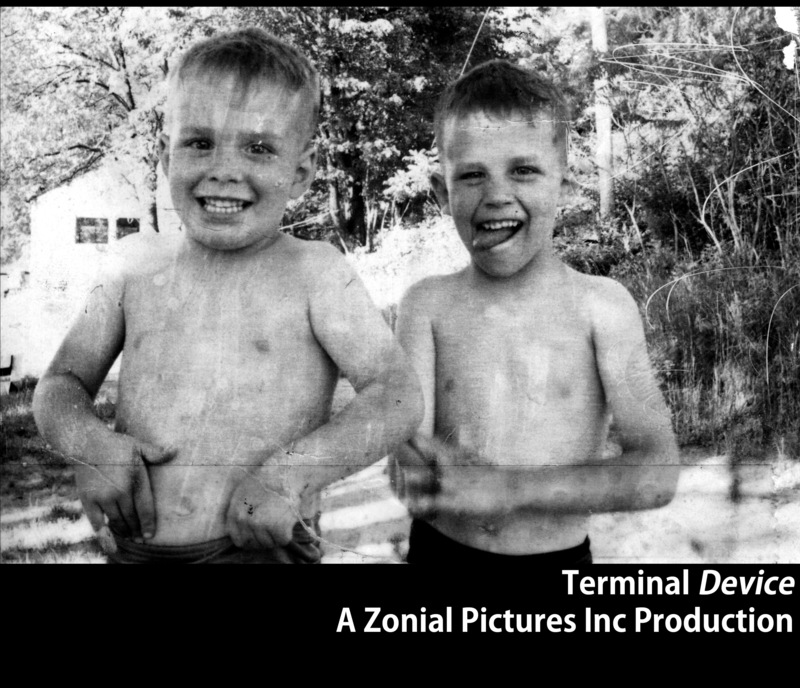 I knew that Terminal Device was to be essayistic, rather than a straightforward, journalistic style documentary. The essay of course is also (usually) factually based but it can arguably be more freely polemical too, and is often very personal, even argumentative. The diary or process approach simply means that one takes however long is needed to shoot and edit, and that these things are undertaken in increments, following a thematic thread or in many cases, a digression. On a fiction film, the traditional approach is to shoot the script in one chunk of time and then undertake the picture and sound editing in subsequent, discrete chunks; the diary film approach lets one shoot a little, edit a little, write some, undertake more research, go shoot something else, etc. The notion of addressing the stereotype we explore in Terminal Device was a natural. I'm a lifelong amputee and over the years of watching films together, Jennifer and I have been struck and fascinated with how the infrequent representation of amputees--and particularly men missing an upper extremity--in mainstream cinema has nevertheless been quite consistent: normally he's the villain, or in a small subset of instances, the buffoon (e.g. Buster, in the television series, Arrested Development). As I suggest in Terminal Device, the stereotype persists to this day. I think it's Disney that currently produces an animated television program for children with all of the Peter Pan characters including, of course, Captain Hook. We knew that the stereotype is one of those 'hidden' ones that most people don't notice until someone says, 'hey, what do you think about this?' It's only when it's pointed out that people recognize stereotypes as fulfillments of one cliché or another. The curious and awkward fact is that, as is implicitly pointed out in Wyler's The Best Years of Our Lives, most such amputations likely occur in the line of military duty or as a function of a workplace accident, i.e. while someone is fulfilling a productive role in society (notwithstanding discussions we might have about the role of the military in society, the fact is that, generally speaking, individual soldiers are honorably pursuing their profession). So for the consequence of such incidents, not to mention the prosthetic coping mechanisms many such amputees adopt, to be taken up and shaped into a kind of murderous stereotype struck us as a fascinating contradiction, worth looking into. An underlying element in handed amputation too, one that we don't address in the film but that informed my thinking and lies embedded within Western society, is that the stereotype has ancient roots. Thieves, according to the Old Testament (and according to current Sharia law among certain Muslim sects), should have their hands cut off. Thus an amputee might be taken in certain societies to be someone who's been rightly punished for their misdeed. The linkage between amputation and nefariousness, in other words, is biblically spelled out. Another more recent and gruesome example of amputation's use for socio-political ends was in the Belgian King Leopold's colonization of the Congo, starting in the 1880's. Many native Congolese suffered amputation by colonial authorities as a way to proscribe and terrorize the local population. The amputees were perhaps the lucky ones, as Leopold's tyranny of course presaged the mid-20th century Stalin, Hitler and Mao dictatorships by killing millions of people. AL: Your movie contains portions that are autobiographical, which we found extremely powerful. What has it been like so far to reveal such personal experiences in this medium? RT: As the stereotype we explored is one I noticed thanks to living as an amputee lover of cinema, it seemed unavoidable that the film should stem from autobiography. It was a method of grounding the film in real experience while also using it to go off on tangents and open up the discussion to ideas beyond my own history. In terms of what it was like to use the personal experiences, at times it was funny (as during the interview with two of my brothers or by including the Oswald photography experience), and at others, revelatory. For example, the section in the film immediately after the Oswald photographs that outlines my early medical history, with pictures of me ostensibly photographed for study purposes, arose from a complete surprise. During the course of my research, I was approached by a librarian at the children's rehab hospital where I was looking for footage to use. She said, 'I've got something that may interest you...' It was a microfiche record of my own medical history at that very institution (which unbeknown to me had changed its name). I had no memory whatsoever of the photograph sessions and of course, had no idea that such extensive medical tests were undertaken when I was two and three years old. 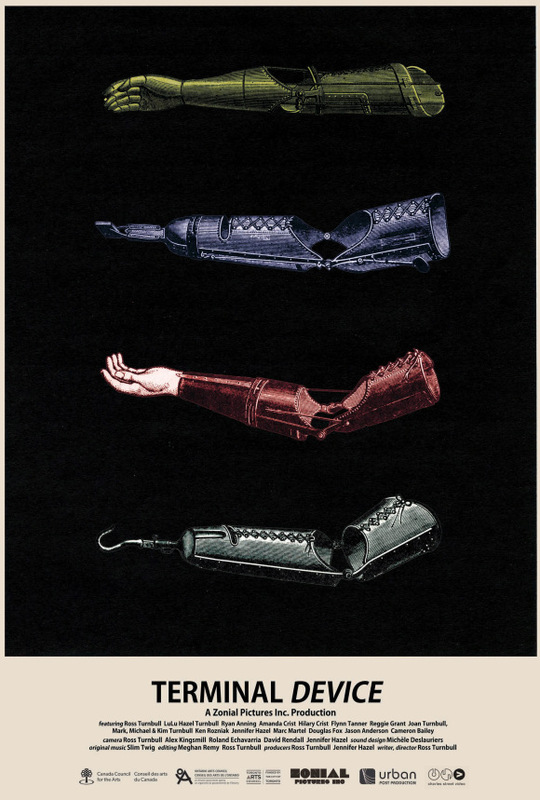 AL: Your film highlights many of the negative images we are fed around prosthetics, particularly hook arms. In your search did you find any positive representations of amputees and/or prosthetics? RT: Wyler's The Best Years of Our Lives, not accidently, is the film we discuss most in Terminal Device, as it has the most positive representation that I was able to find, while engaging directly with the fact of amputation and hook-wearing. We also refer to two other films featuring that same actor, Harold Russell. They are called Night Moves and Dogtown, and in both he plays sympathetic, positive characters. I really have no complaint about how the characters played by Russell were represented. Sadly, he was not cast very frequently. A minor instance of a film that more or less treats the hand amputation casually is Bad Day at Black Rock. My issue with that work is that two-handed Spencer Tracey, playing the amputee, is seen throughout the film with his 'stump' in his pocket. As fine an actor as he was, I still didn't find the portrayal all that convincing. After we finished Terminal Device, George Miller's Mad Max: Fury Road was released, and I was delighted by the Charlize Theron character, Furiosa, who is an upper extremity amputee. The thing about that particular instance, and this is what I really liked, was that nothing was made of it. It wasn't mentioned, it wasn't made an issue, we didn't see any flashbacks to explain why she's missing her hand...nothing. It just is. I found that tremendously refreshing. I went so far as to write about it: https://terminaldevice.wordpress.com/2015/05/29/hook-woman-the-positive/. AL: Describe your dream representation of disability in film/media. RT: My ideal representation is where we see characters who are 'different' represented without reference to their difference, unless perhaps--and I would think this wouldn't happen very often, as how boring is that?--it has some direct bearing on the story or plot. Instead, those with a difference are simply treated as part of the human panoply. No big deal. AL: I was pretty shocked at how many images you were able to find and how I had seen so many of them already without realizing their impact. What was the process of finding these images? Was it difficult to dive into that search personally? RT: The process started with the obvious, high profile films like Spielberg's Hook and the 2003 version of Peter Pan. From there, conversation with people steered me toward other works. Enter the Dragon was one that came from a casual conversation, as was The Empire Strikes Back (not ever having been a fan of Star Wars, I'd never seen it). Other, lesser known films also came from research or ideas given to me when I spoke of the film to people. I certainly didn't use all of the examples I could have, nor did my research extend beyond English language, primarily Hollywood-produced fare. For example, I'm given to understand there are various Asian films that represent amputation, perhaps even positively (like the handful of films devoted to the One-Armed Swordsman), but I have not seen them. And no, it wasn't difficult for me personally, merely time-consuming. Each representation I found that fulfilled the stereotype usually engendered some eye-rolling (not to sound condescending, it's just a matter of frequent exposure making one a little jaded...) but I didn't take it personally. In at least one instance, the horror film Candyman, I ended up quite enjoying the experience of the film despite the stereotypical representation. That character's hook is unequivocally ridiculous, but the film is so weird and dream-like that I found it worth it. AL: What do you want audiences to leave Terminal Device with? RT: Something to talk about and vivid images to remember. AL: What are you most excited for at Superfest? RT: The opportunity for another audience to experience the film and have it engender conversation. It's not easy to get independent films in front of audiences, particularly quirky little numbers like Terminal Device, so I'm pleased and grateful for the chance. Plus, I've never been to San Fransisco, so a visit to California is a great bonus. RT: It's an honour, frankly. Superfest's Emily Beitiks and fest sponsor Michele Spitz have been so supportive and kind that I feel blessed to have the film included. It's made my anticipation of the event very positive. I'm also fascinated to have the film play in the context of a disability festival. It meant that we produced a version of the film at the behest of the festival, with captions and audio description, which didn't previously exist. The new version simply opens it up to yet more possible audience members, for which I'm delighted. We (perhaps naively) never anticipated that the work might form an intervention of interest in disability studies. This is my own ignorance of the field at question, but I'm intrigued to learn more and think of this opportunity for discussion as a good introduction. Interestingly, I've been approached by a disability festival in Barcelona, which sought me out to encourage me to submit Terminal Device. So perhaps it may play for a Spanish audience roughly equivalent to San Fransisco. AL: Do you have any future projects lined up that you would like to tell us about? RT: I'm currently gearing up to shoot a short, time-lapse film in Algonquin Park called Consolation. It's about grief, landscape and how the cinematic image comes to be. Algonquin Park is an enormous wilderness park in Ontario. The place we're going to is about twenty miles into the bush, and it's not even close to the most remote part of the park. In any case, there are no telephone poles, hydrants, habitations, corner stores...there is a dirt road on which you travel past rocks, trees, forest, swamp, lakes and rivers. Stereotypically Canadian, perhaps, but rejuvenating to visit, so long as you go in prepared. Buy your tickets to Superfest to see Terminal Device and more great films!